What Are We Doing? Flux Factory has assembled a team of artists and art professionals to create a proposal for a monument to the city of Paterson, New Jersey. We will keep a headquarters at the Paterson Museum which will act as a meeting place, research library, and installation. We are going to immerse ourselves in Paterson in order to come up with ideas that reflect the real people and the real experience of the place. During our six weeks in Paterson there will be daily events like walking tours, lectures, readings, discussions, performances, get-togethers, picnics, boat and bicycle rides, and debates, all free and open to the general public (not including transportation). Tours will be given by Flux Factory and Patersonians alike. Please visit our website for an updated list of event schedules. Why Paterson? Paterson, New Jersey is a special place. Founded as the first planned industrial city by Alexander Hamilton and others, it played a major role in the industrial and economic development of the United States. But Paterson is also part of the cultural imagination of our country. William Carlos Williams wrote an extended lyric poem taking Paterson as his title and subject. The important American artist Robert Smithson considered Paterson and the surrounding Passaic Valley to be a source of artistic inspiration. Indeed, Paterson and the American Imagination are deeply connected. Anything Else We Should Know? Monuments are often a disappointment, to say the least, though human beings have been building them since the beginning of civilization. There are places and people we all want to pay homage to. But the end result is often dull and lifeless, the very opposite of the subject being memorialized. What is a monument? Is it an ode to bygone days? A celebration of the past or an expression of the future? We think that �Paterson� will create an artwork out of the process of thinking through these questions. Most fundamentally, this project carries forward an idea of collaboration that animates everything we do at Flux Factory. Flux Factory projects are always about bringing groups of people together in order to create an experience. In this case, the idea of collaboration is being pushed to a whole new level: a collaboration that involves an entire city. Indeed, more than an entire city, since a basic assumption of this project is that Paterson is a lens through which one can discover things about the American experience in general and involve people from all over the world. PATERSON PARTICIPANTS: Jean Barberis, Mikey Barringer, Angela Beallor, Jason David Brown, Christine Conforti, Joseph Costa, Giacomo De Stefano, Peter Duyan, Alita Edgar, eteam, Neil Freeman, Dana Gramp, The Ivanhoe Artists Mosaic of Paterson, Suzanne Joelson, Joe Milutis, The Paterson Museum, Leonora Retsas, Joe Ruffilo, Shuli Sade, Ruth Stanford. �Paterson� is made possible with public funds from the New York State Council on the Arts, New York City Department of Cultural Affairs, and Queens Council on the Arts, as well as generous support from the Andy Warhol Foundation for the Visual Arts, The Greenwall Foundation, and Carnegie Corporation of New York. *PLEASE NOTE: Schedules may be subject to change, so please visit our website, www.fluxfactory.org, for more information. Most tours, unless otherwise indicated, are walking tours. Please wear comfortable shoes and be prepared to walk. Town Hall Meetings: Discuss the project with the design team. This is open to the general public�Patersonians and New Yorkers alike. Make your voice heard! Paterson reading group with Joe Milutis: The �Paterson Reading Group� will be an informal discussion of William Carlos Williams� epic poem Paterson, meeting on throughout June, and featuring tours and special guests. Participants will be expected to furnish their own copy of �Paterson�; we�ll be using the �revised edition� with annotations by Christopher MacGowan. To register for the reading group and receive updates and meeting locations, please email joe_milutis[at]brown.edu. Discussion of Book I of Paterson. The Fl�neur Tour: Three cooperative, unstructured car drives through Paterson with artist Neil Freeman. PLEASE NOTE: Because of space, these tours are limited to 3-4 participants each. First come first serve. Please RSVP to 718.707.3362. The Pilgrimage Tour: Jean Barberis takes you on a stroll that starts in Grand Central Station and leads you all the way to the Great Falls in Paterson. Actually, it�s only 20 miles, so don�t be shy! Beverages are on us. The Paterson Art Scene-War Stories from Those Who Know: Artists Joe Ruffilo and Don Kommit give you the lowdown on Paterson�s rich artistic and literary history, from personal stories of Kerouac and Ginsburg to the present. The Religious Institutions of Paterson: Their Architecture and Influence on the Community: The city of Paterson has nearly 140 places of worship. This tour will focus on the design of a few of the institutions and their effects on the growth and development of the community. Led by Leonora Retsas. Wednesdays at the Ivanhoe: Visit the one and only Ivanhoe Artists Mosaic, a nonprofit arts organization, meeting house, and gallery in Paterson, for their monthly "Open Mike" with the opening reception for "Love Affair with Paterson" a tribute to all there is to love about the world's first planned industrial city. See website for details and directions to all events, www.ivanhoeartists.org. 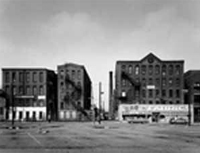 Industrial Archaeology Tour: Tour the city�s unbelievable old mill buildings and industrial architecture with Shuli Sade and others. Cinematic Visions of Paterson: Films about Paterson, films by Patersonians, and unexpected films� An event with Mikey Barringer. To be followed by a party at the Ivanhoe. A Re-Tour Of The Monuments Of The Passaic: Travel with Peter Duyan as you re-create, re-walk, and re-photograph Robert Smithson's experience of monumental discovery through Passaic, New Jersey. What are today's New Monuments? Lets find out. Where to meet: Port Authority NYC. Meet at the 190 bus gate going to Paterson. Roundtrip tickets between NYC and Paterson are $9.00 and can be purchased at the bud station. Call 646.708.2360 for more info. By Car:Follow Route 80 West and signs to Paterson. For the Paterson Museum, get off at Exit 57-A/B, to Downtown Paterson. Flux Factory is a 501(c)(3) nonprofit arts organization.